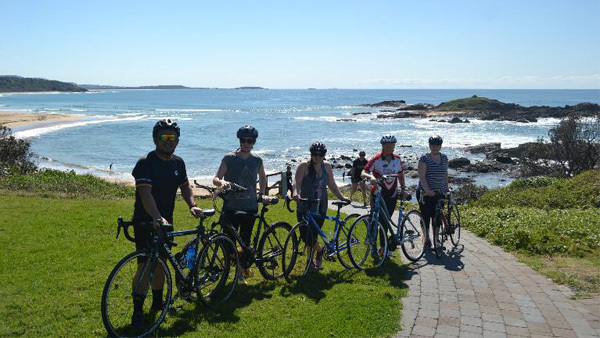 Coffs Coast Cycling Tours are proud to show you around our beautiful region. Cycling on a bike, enjoying the fresh air, with your personal guide is the best way to see the countryside. Our cycling tours can be tailored to your fitness and ability. Don’t have your own bike handy? We can organise bike and helmet hire at an affordable price. We take you on our favorite cycling routes and show you some great views. Travel along on sealed roads and shared paths. Right from the start, you can jump on your bike and take in the breathtaking scenery from the picturesque tree lined street of the Sawtell cafe precinct to the river views of the Bellinger River in the south and the glorious Coffs Harbour marina and jetty areas heading north. Road and path conditions can change at any time due to roadworks, weather events or maintenance. We provide back up service where required. Our 3 hour Coffs Harbour sights tour will show you the places that are a must see for every visitor to our beautiful region. There is a variety of half day tours available. We visit Repton, Bellingen or Woolgoolga, coffee stop included. Tours customised according to fitness. Send a half day enquiry and we can organise with you with destination would be most suitable. Let us customise your full day tour. Visit the hinterland and then see the picturesque sights around Coffs Harbour. Lunch and coffee stops included. Click on “Booking Enquiry” button below to see prices and make an enquiry direct with Coffs Coast Cycling Tours.